Definitely worth the $6 a month. All those lovely goodies. That cloud picture you have posted RainDammit' looks like the centre of the low is inland and l suppose from the mid layers or uppers, it may be. Here is a snap of radar with wind profile highlighted and best bet marked for the centre of rotation on the coast Lucinda point 1002.5 hpa. certainly a chance of big rainfall totals with storms Ilurain, but i dont think its going to be as widespread as its being shown. problem is catchments up there are already full as you probably well aware. personally i would let the weather get in the way of my plans but having said that if you get stuck, could be in worse places! Go for it. This system is as likely to go to Canberra as anywhere else. I have held off going to Dingo Beach for nigh on 10 days because of Penny. Truth be told, I am tired of her. If we're really really lucky she'll come out past us, and maybe well get another 13mm of vertical rain for half an hour, like we did with Owen on his way back again. The Daily mail is at it again. Street Drama. Spot the mistakes in this news flash. 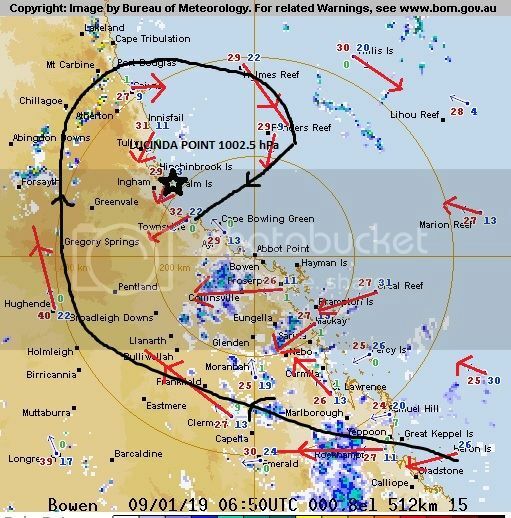 A treacherous cyclone is set to wreak havoc across Queensland over the next few days, as it nears closer to the coast. I have followed Penny Up and Down and around for days now .. Sorry this post is not Technical! Have to make a decision now. So do I leave Forrest Beach tomorrow for Cairns ..or is Met eye  Correct and Ingham may get. 200mls + over next two days ..and if they do could I potentially be cut off . The answer probably is if I go we will flood with Torrential rain and if I give up my night we will get zippo. Anyone have a better answer?? Thanks for all the replies, I haven’t canceled so I guess I am going. To be honest it wasnt just the thought of getting cut off, its also the fear of missing another Rain/Storm event. I have a Incredible/Rotten Luck track record of being out of town for any Major event ..be it Cyclone, Flood Or Torrential Rain and Storm. If I could guarantee it was going to Rain and Storm all night/day I would give up the five starMotel for the bliss of laying in bed listening to it pour all night. Ex. Penny is becoming more active this morning. She looks better today than the last couple of days looking at the IR Sat loop, as well as on the Bowen Radar. Weather Situation: At 4am AEST Thursday, ex-tropical cyclone Penny was located inland, over the southern Herbert and Lower Burdekin. A trough associated with ex-tropical cyclone Penny is expected to move northwards along the tropical east coast during the next 24 hours and may produce areas of heavy rainfall. Locally heavy rainfall, which may lead to flash flooding, is expected to occur this morning in coastal and adjacent inland areas between Proserpine and Townsville, particularly with thunderstorms. Isolated six hourly rainfall totals between 150mm and 200mm are possible. Locations which may be affected include Bowen, Ayr, Charters Towers, Collinsville, and Clare. Strathbogie, south of Ayr recorded 130mm in 3hr to 3am and 266mm since 9am Wednesday. Groper Creek recorded 108mm rainfall in 3 hr to 3am and 111mm since 9am Wednesday. Ridgelands Alert, west of Mackay, recorded 145mm since 9am Wednesday. since this warning was put out, Strathbogie now over 400mm mark. I thought so too, I would have sworn she was dead last night. Whilst good to see for the farmers, the totals aren't massive by Qld standards. Marcia dumped 250mm in 3 hrs, Debbie 600+ in 24 hrs, both over substantial areas. Penny system has been borderline in meeting BoM severe weather thresholds. OMG that is funny. Total hogwash, but funny. Bad Daily Mail. The remains of Ex Penny. 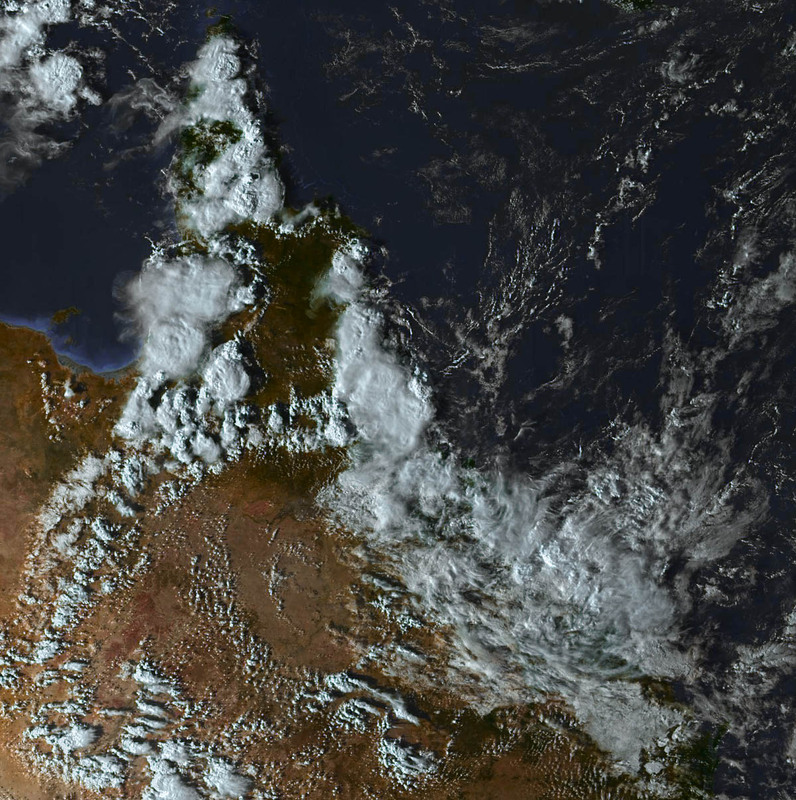 5:20pm image from Himawaricast on Jcsat2B. EPS ens think there's a reasonable chance penny may have another go in the NW. Likely based on a returning mjo signal within the indo in ten days. Will there be enough of her left to still call her Penny? 6 registered (wet sky, Teddy, DDstorm, mysteriousbrad, 2 invisible), 61 Guests and 3 Spiders online.